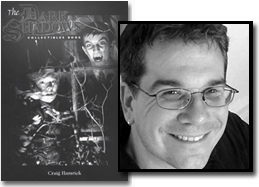 The CD recording of the play Dark Shadows: Return to Collinwood is now available. Click here to visit the MPI site to purchase it. 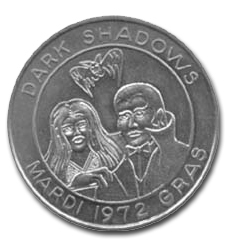 In 1972, two years after they lit up the silver screen together in House of Dark Shadows Jonathan Frid and Nancy Barrett were immortalized on a Mardi Gras doubloon as their characters in that film. This is not an official, licensed item, and there are several color variations, including purple and gold. Several cardboard displays were used to promote the DS Paperback Library books while they were on the market -- including this free-standing version and a similar counter-top one. Not really toys...these odd "Dark Shadows Horror Head Pillows" are a little difficult to classify. 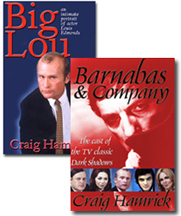 They were sold separately, and marketed with a TV commercial. With his spiked hair, the vampire looks a bit like Barnabas, and a werewolf is a werewolf, but the witch doesn't look anything like Lara Parker's lovely portrayal of Angelique. Because the pillows aren't very closely related to the show, they aren't particularly sought-after, but they are extremely rare, so a completist may have this on their "want list" for a while. 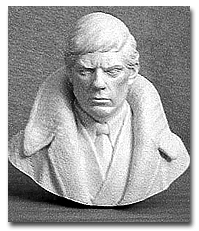 In 1991, Action Kits International released a "Barnabas Bust" which strongly resembled Jonathan Frid's portrayal of the vampire. 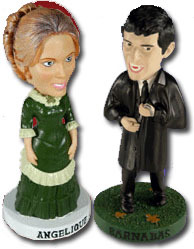 Together Again; Angelique and Barnabas bobbleheads are the newest MPI-Produced DS collectors' items. Besides releasing the show on DVD, MPI Video has issued a bunch of cool new collectibles, including the bobbleheads and Barnabas Boxer Shorts. LINK: VISIT THE MPI MERCHANDISE SITE.